I've mentioned previously on the blog that I'm an official blogger for Manchester Fashion Week (exciting news to come on that front!) and just before Christmas I met up with a handful of the girls to discuss the latest updates on the event and also to receive another fab blogger box! We were really spoilt this time with an amazing festive box crammed full of goodies. So as you can see, we were given so much! The box included stationary, beauty, fashion accessories and skincare products. 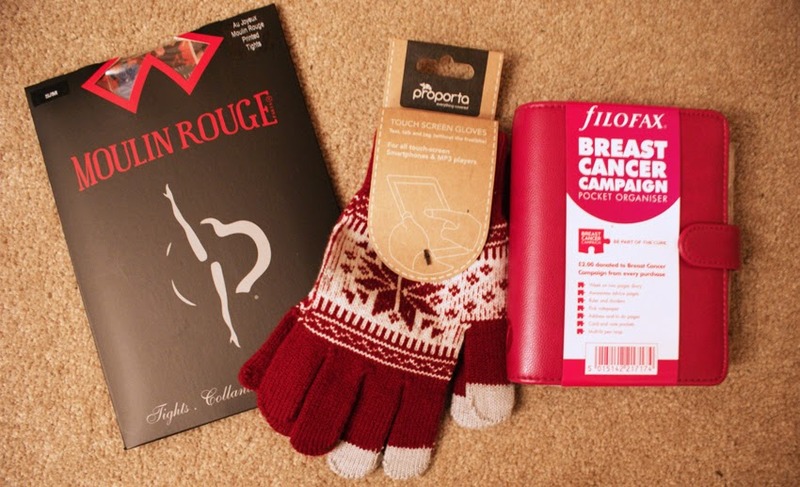 Here we have some patterned tights from Pamela Mann's Moulin Rouge collection, touchscreen gloves from Proporta (they really do work) and one of my fave pieces; a Filofax from Paperstone. I'm pretty sure getting organised is on everyone's to-do list for 2014 so it's really handy to have something I can jot down important dates and events in. The above are some bits from Wilko's. 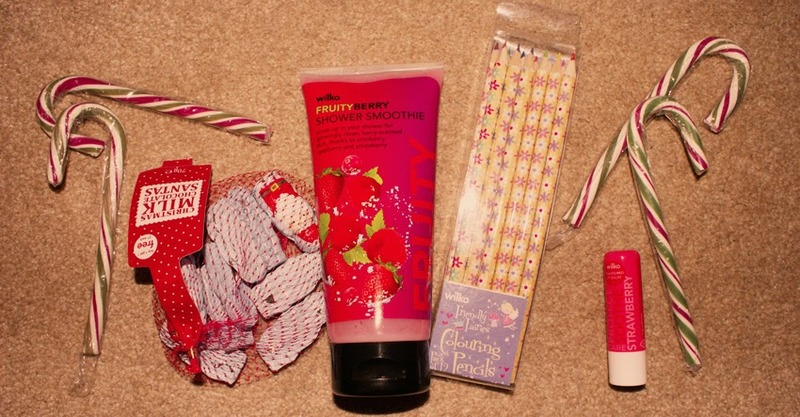 The candy canes and mini Santa chocs went down a treat at Christmas and the shower smoothie smells amazing! Will definitely be checking out what other varieties are in the range. I was really pleased to find a few Lacura products in the package. Lacura is supermarket chain Aldi's own skincare range which I'm already a fan of. I swear by the Lacura concealer pen which is a great dupe for YSL's Touche Éclat. I've been buying this for a few years and last time I checked, there are only three shades but the lightest works well for me. I think it retails for £3.99 which is a lot cheaper than the real deal! I received a great hand and nail cream in my box (I'm always on the hunt for good ones due to the skin condition I have which often leaves them dry) and also their Renew 'Multi Intensive Serum' with Q10. I've had something similar to this from Lacura in the past which was a cream of the same name but it contained vitamin C as the active ingradient rather than Q10. It was really good though I'd not seen it in the shops to buy another so was chuffed when I got this one to try; I presume it must have replaced the old one I had. This one has a different consistency and scent but goes on really well and feels lovely on your skin. 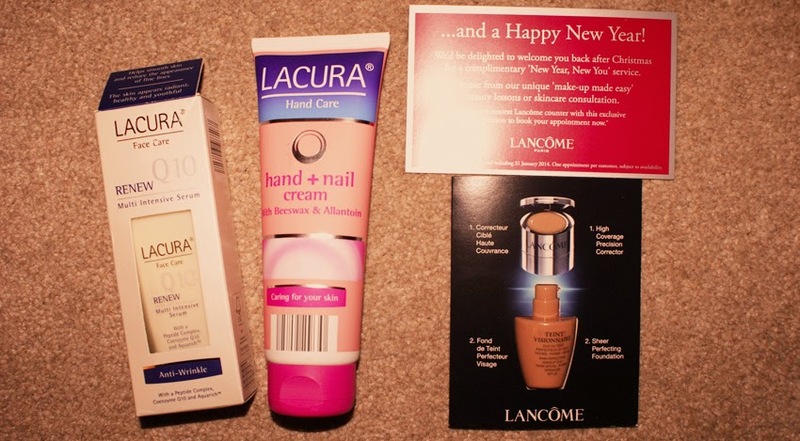 We also got samples from Lancôme and an invitation for a skin consultation. I received a sample of their Teint Visionnaire Foundation Skin Perfecting Makeup Duo which is essentially a foundation/concealer combo. The sample is a little dark for me but I've heard good things about it. 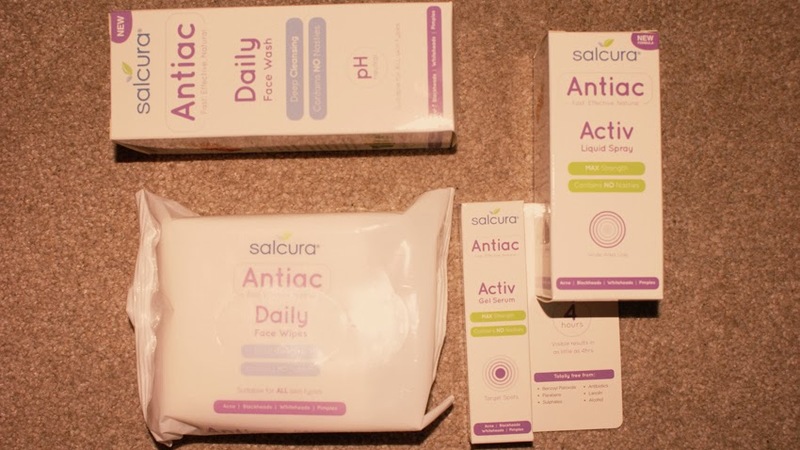 Probably the best stuff in the box for me was a collection of skincare products from Salcura's Antiac range which boasts the impressive accolade of 'Best Acne Brand' from TV's Embarrassing Bodies. I don't have the best skin around, particularly after the indulgences of Christmas so I was excited to try these. Salcura's spot-fighting products are split into two ranges; Daily, for everyday use and Activ for breakouts. I received the Daily face wash and face wipes and the Activ liquid spray and 'on the spot' gel treatment. I have to say that after using all of these for a few weeks now, I'm really impressed! I've definitely noticed the difference to my skin which has less blemishes. The Activ Gel Serum is particularly good; honestly the best I've tried. Salcura's products are completely free from artificial chemicals and ingredients which is something that's become more important to me recently. They also have products to suit other skin conditions like eczema and psoriasis. I've suffered from dermatitis on my hands for a number of years and use a prescribed steroid cream on them, though I don't like to use it too often so their Derma Spray really caught my eye as an all-natural product. Though I've not seen them myself, their website says that products are available at Boots stores. You can also order trial packs for free from their site- I've just ordered the derma pack which I can't wait to try. 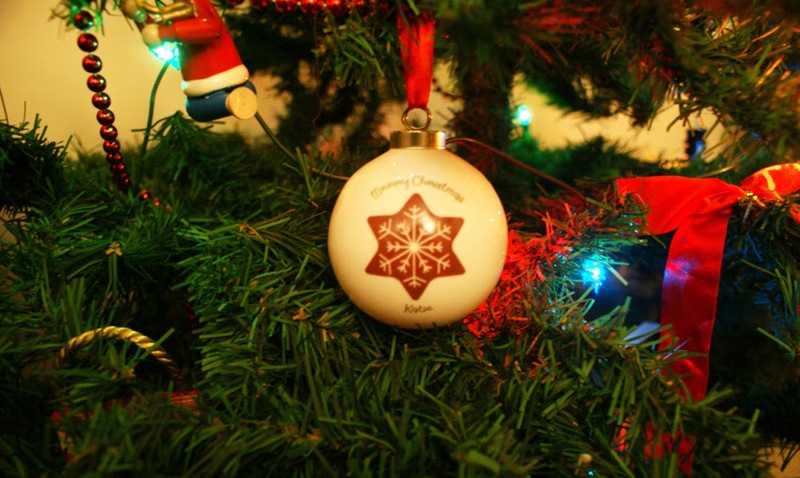 Oh and one other piece I missed photographing with the rest of my loot was this awesome personalised bauble from Getting Personal. I hung this on my tree as soon as I got home! I love personal gifts and this one is of a high quality- I might buy some as presents next year. Have you discovered any new brands recently?